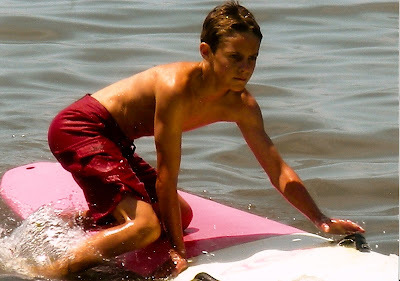 After his success in the Junior Lifeguard paddle events, Ben decided to look for bigger fish to fry. Last weekend he took a paddleboard down to Carmel for a friendly paddle. He ended up winning the 2 mile course in the 12' stock division and placing 2nd overall. As one of the older competitors asked, "How old is that kid and how did he learn to draft someone? Ben's reply, "uhh, I'm 12 and I've just been spending time at the beach messing around with my friends." Again, the master of understatement.